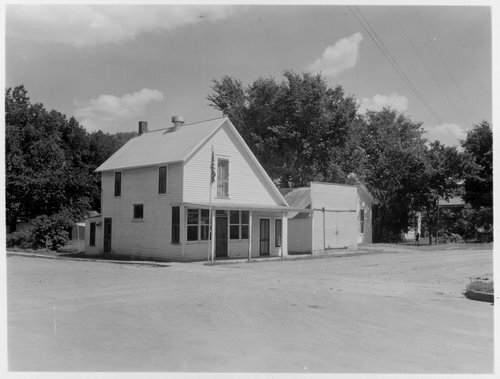 This black and white photograph shows the post office in Richland, Kansas. The two-story wooden structure closed for business on October 31, 1969, when the town, located along the Wakarusa River in the Monmouth Township in Shawnee County, became a part of the flood plain for Clinton Lake. Today, the only reminder of Richland is the broken pavement that once covered the streets.